Phoenix expands its bench presses from two to forty tons. 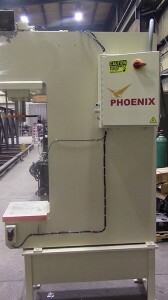 Phoenix expanded its standard bench presses which range from 2 to 35 tons to design and build a custom 40 ton bench press. 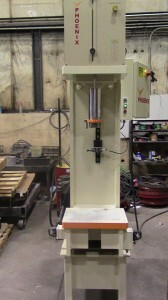 The press has daylight of 18”, stroke of 12”, and reach of 10”. The bed size is 20” x 15 1/2”. A 40 gallon reservoir is integral to the press structure. A custom mounting bench was also designed for the press. Press controls included our quality control circuit that allows the press to return automatically after the ram contacts the limit switch positioned 3” above the contact point. This allows hands free operation from the contact point. Electric controls are an Allen Bradley MicroLogix 1000 programmable control with 16 I/O.